Luxury, privacy and Adirondack views across the lake. Year-round 3-bedroom vacation home (sleeps 7) on 2 acres in West Addison with 300' of lakefront built in 2005. Timber frame construction with fully equipped gourmet kitchen, dining room & two-story great room facing the lake with large stone fireplace. Master bedroom on main level has king bed with lake views, includes gas fireplace and large bath with claw foot tub and shower. Two large bedrooms upstairs both have full baths, one with queen bed, the other with three twins. Cherry and birch hardwood floors, natural slate in kitchen and baths. Wraparound screened porch facing the lake leads to bluestone patio and large flat lawn which slopes to beach of gray shale with 50' dock, chairs, canoe and rowboat. Fifteen minutes to Basin Harbor for golf and tennis, 20 minutes to Vergennes & Middlebury for dining and shopping, 45 minutes to Burlington airport. No smoking or pets. All linens are provided. Beautifully equipped large bathrooms in each bedroom. Beautiful home right on the lake. Very well appointed, very comfortable, super cozy with fireplace, view, porch - loved it! We couldn't have asked for more. Will be back next year! Thank you for a memorable long weekend! Wonderful home that is comfortable and spacious. Well maintained lawn and beautiful flower beds. My family and I had a wonderful and very relaxing week in this gorgeous home. It is beautifully decorated in a style that is not only charming but also in keeping with the exposed wooden beams in the cathedral ceiling and elsewhere. The kitchen is well stocked with equipment so we felt right at home. We brought food with us so that we could cook most of our meals at the house or prepare picnic lunches if we were making day trips to explore. However, there is a grocery store not too far away which we also had to visit. We made use of the many Adirondack chairs to relax and enjoy the serene view of Lake Champlain. The porch was the perfect place to have a cup of coffee in the morning while listening to the many birds and watching the wildlife on the property (mostly bunnies). Outside in the yard, we talked, read, sunbathed, napped in the hammock (which was very popular) and generally just enjoyed each other's company and being away from the hustle and bustle of everyday life. A little ride around the lake was taken in the rowboat provided to us and there is also a canoe. On our last evening we gathered around a bonfire on the beach to enjoy a very pretty sunset. The house and grounds are just beautiful and the owners were very responsive and great to deal with. I would not hesitate to recommend this property and hope we have the opportunity to come back some time in the future. 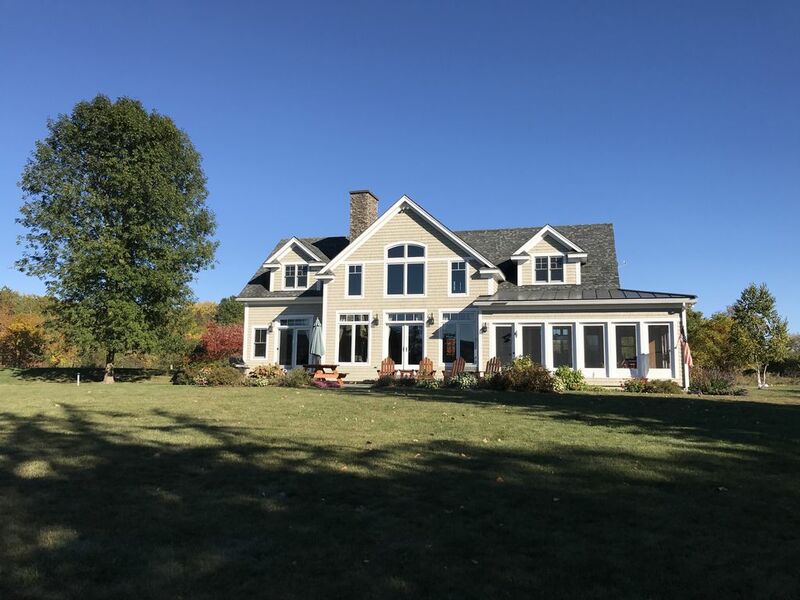 This is a beautiful home on a beautiful spot on Lake Champlain. This is a year round home with every amenity one needs for a perfect vacation in summer or winter. We are people who spend a great deal of time in the water and there are weeds close to shore. We swam with friends so it was not a problem for us. The beach is very nice, flat and large. We plan to return. We had the best family vacation! Totally unplugged and relaxed! This is the way it is suppose to be! House and lake are just gorgeous. So peaceful. The house had everything you could possibly need. Perfect space, open living, LOVED the screen porch! Outside patio and lawn👍! We kayaked, paddle boarded, fished, swam, relaxed on the great dock for hours, played croquet, did jigsaw puzzles, and grilled for dinners! The house is amazing, the owners are beyond hospitable and the views are breathtaking. We love enjoying our week here with the family to enjoy the tranquility of the lake and the Adirondacks. Gives us an opportunity to reconnect as a family.